Shirts With Random Triangles: Bosie State sells Broncos Stadium naming rights to Albertsons. 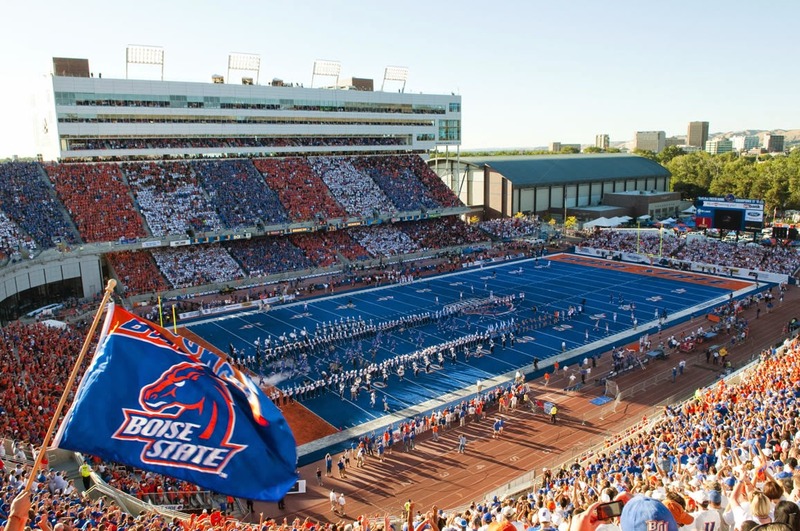 Bosie State sells Broncos Stadium naming rights to Albertsons. Boise State has sold the naming rights to Broncos Stadium. The home of the infamous blue turf will now be known as Albertsons Stadium. Albertsons, a supermarket retailer based in Bosie, Id. has purchased the naming rights to the now-former Broncos Stadium under a 15-year, 12.5 million-dollar agreement with the school. First-year Boise State head coach Bryan Harsin commented on the new agreement. The rebranding comes during a notable period of upheaval for Bosie State, which saw former head coach Chris Petersen leave for Washington, and the implementation of new College Football Playoff system, which could make the chances of winning the mythical national title even more difficult.